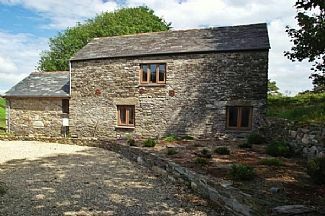 The Olde Barn, a roomy detached stone cottage at Staddlestone, approx 1 mile from Camelford, North Cornwall. Boscastle & Tintagel (King Arthurs Castle) are 6 miles, with Wadebridge 10 miles. Good sandy beach at Trebarwith Strand is 6 miles. The cottage, an impressive barn conversion, is just a few miles from Bodmin Moor with its many attractions and great for walkers. The Eden Project and the Lost Gardens of Heligan are within a short motoring distance. The Olde Barn is situated on a smallholding on Carcade Farm, one of two cottages in a peaceful rural setting with panoramic country views. There is a small enclosed rear garden area. Bedroom 1 has 1 double Four Poster bed and en-suite with shower unit, washbasin & toilet. Bedroom 2 has 1 small double bed (4 ft width). Bedroom 3 has 3 single beds. All bedrooms are downstairs. Downstairs utility room with washing machine and spin dryer. Also a downstairs bathroom with bath, overhead shower, washbasin & toilet. Upstairs is a roomy open plan living area, with panoramic views over the surrounding countryside and towards Bodmin Moor. Patio doors from the lounge area open onto the substantial raised terraced patio with table and chairs/seating, which is enclosed by a glazed balcony (enjoy the views from the patio whilst taking your meal). The kitchen/dining area has an electric cooker, microwave, fridge. The lounge area has a 42 inch Flat Screen TV and DVD. WI-FI and Internet access available, on pay as you go, at usual internet charge. Also a downstairs bathroom with bath, overhead shower, washbasin & toilet. Linen,central heating and electric inclusive. Cot & High Chair. WI-FI & Internet access available,on pay as you go at usual internet charge. Plenty of adjacent private parking for 3 cars. . Garden furniture. One dog welcome. Southwest Holiday Cottages have a large selection of cottages throughout Cornwall . Our office is usually open 7 days a week until 8 p.m. Tel: 01752 260711. You can book and pay online on our own website. If you are looking for a company to handle the letting of your holiday cottage, or you wish to book a cottage, we will be pleased to hear from you . All our cottages have been personally inspected so we can assure they are of a good standard and offer good value for money. We varied types of cottages to satisfy all categories of holidaymaker. We look forward to having you holiday with us. En-suite with shower unit, washbasin & toilet in bedroom 1. Also a downstairs bathroom with bath, overhead shower, washbasin & toilet. Plenty of off the road adjacent private parking for 3 cars. Upstairs roomy open plan living area, lovely views. Patio doors from lounge area open onto the substantial terraced patio which is enclosed by glazed balcony. 42 inch Flat Screen TV and DVD. WI-FI & Internet access, available on pay-as-you-go. The kitchen/dining area has an electric cooker, microwave, fridge. Washing machine & spin dryer in utility room. 42 inch Flat Screen TV and DVD. WI-FI and Internet access available, on pay as you go, at usual internet charge. Patio doors from lounge area open onto substantial raised terraced patio with table and chairs/seating, which is enclosed by a glazed balcony (enjoy views from the patio whilst taking your meal). Excellent sandy beach at Trebarwith strand is 6 miles. Nearest airport newquay approx 35 miles. Approx 1 mile from Camelford, North Cornwall. Boscastle & Tintagel (King Arthurs Castle) are 6 miles, with Wadebridge 10 miles. Good sandy beach at Trebarwith Strand is 6 miles. The Eden Project and the Lost Gardens of Heligan are within a short motoring distance. Newquay approx 33 miles. Bude 16 miles. Camelford is an historic small town, a typical old Cornish town with lots of character. There are restaurants, cafes, pubs and banks, and a good Park nr the centre. Free parking in towns car park next to town centre. Camelford also has a leisure centre with indoor swimming pool and other facilities. The beach resort of Bude (16 miles further north) is known as a quieter alternative to Newquay and has miles of classic sandy beaches and a huge free open air swimming pool on the main beach. At Bude are also the Canal walk/rowing up the canal (boat hire) /Wildlike Bird Sanctuary. Nearby Tintagel has King Arthurs Castle perched on the clifftops overlooking the small beach- great walk to the castle from the village. Quaint Boscastle fishing village also 6 miles away is a great favourite. The 15th cent pier with the steep valley sides is well worth a look. While in Boscastle pop into the Witches Museum. At nearby Wadebridge is Cornwalls top tourist attractive - The Camel Trail. This is a cycle path from wade bridge to Padstow and further, you can hire the bikes in either Padstow or Wadebridge at a modest cost. For walkers, explore Bodmin Moor which is only a few miles away. Visit historic places of interest on the Moor- in fact there is lots to do and see on the Moor. Daphne Dumauriers Jamaica Inn, Fishing and boating on Colliford and Siblyback Lakes. Golitha Falls, St Neot Holy well, North Cornwall Tropical Bird and Small Animal Gardens and much more. Part week bookings are welcome but you have to come between the Saturday to Saturday period becayse the cottage is cleaned on the Saturdays.